We Listen to innovate custom solutions for you! We met Dan from a supporting Engineer working with us on a plant start up elsewhere. Dan's original plant design was to haul bio-solids from a neighboring plant to seed the new wastewater plant. Dan felt pressure to reduce the cost of hauling and the time it would take for the plant to get up and running efficiently. BioLynceus was brought in to consult on the issues. We listened to the needs, created a customized proprietary clean bio-program that was simple to implement. Within days the plant was efficiently running with minimal cost and no residual issues to deal with. Chris attended a trade show searching for a way to reduce their solids issue. His curiosity about our frogs fling'n around brought him to us. We listened to what had been tried but didn't solve, we heard the continued frustration that Chris felt, the attempts seemed to cause damage to the environment without giving strong results often causing new issues. ﻿Our team developed a customized natural solution to reduce the collection system solids, it was simple to implement and saved them 10X what the solution cost in the first year. Chris still collects our frogs. His system is running great even with increases coming in. His expenses are a fraction of what they were without BioLynceus solutions. *We value your privacy- this information is used for contacting you to discuss these challenges. You may change your settings at anytime. Wastewater facilities often need to enhance biological processes, normally nutrient removal, to achieve discharge permit requirements. Many currently used formulations can have positive results but contain many negative aspects of use. The costs of these could be acceptable until you see what the negative cost is after they occur. Candy Carbon® is an option to provide positive long term results without added expenses in building injection stations, adding flammable products or chemicals that could cause long term damage or problems that need to be solved later. 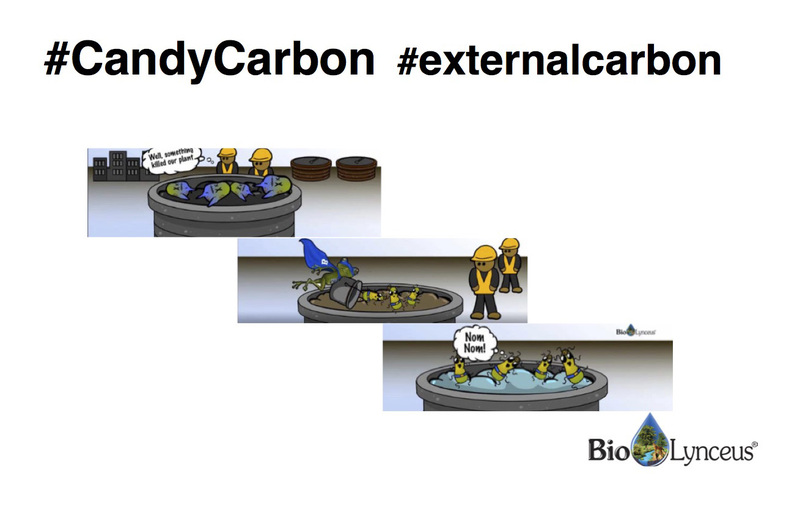 Candy Carbon® may be used in any wastewater stream (Industrial, Municipal, Animal) that needs additional BOD/COD, Volatile Fatty Acid (VFA) production or organic carbon to achieve permit requirements. It is a cost effective solution that provides results that enhance the environment without negative aspects that have hidden costs. Before BioLynceus was consulted on treatment for increased denitrification, the utility was paying surcharges for being over limit of 10 mg/L. After treatment began in 2015, there was a decrease in effluent Nitrate concentrations. The utility continues to be in compliance and has paid no surcharges for violating their permit. As a premier provider of natural solutions for water and wastewater, BioLynceus provides custom blended products for environmental solutions. We only use proprietary blends of live materials that enhance the efficacy of programs for environmental enhancement.